TAMPA -- On the final night of their nominating convention, the Republicans sent to the podium a man considered their most valuable and talented speaker as a contrast to a president widely perceived as one of the most gifted orators of his generation. That man wasn't the Republican nominee for president, Mitt Romney, but rather the one who introduced Romney to America's voters. The son of working-class Cuban immigrants, Florida Sen. Marco Rubio often points to his own biography as an example of the American Dream. But in his prime-time address Thursday night, Rubio tied his own family’s story to Romney’s as a living illustration of America’s exceptionalism. Rubio described sacrifices made by his parents -- his mother a store clerk and his father a banquet bartender. “He stood behind a bar in the back of the room all those years, so one day I could stand behind a podium in the front of a room,” Rubio said to a standing ovation. Romney’s father was born in Mexico, and his grandparents returned to the United States during the Mexican Revolution. Rubio’s portrait of Romney aimed to not only contrast his image as a wealthy businessman --which Democrats often use to portray the Republican nominee as being out of touch with ordinary people -- but to offer encouragement to struggling Americans. 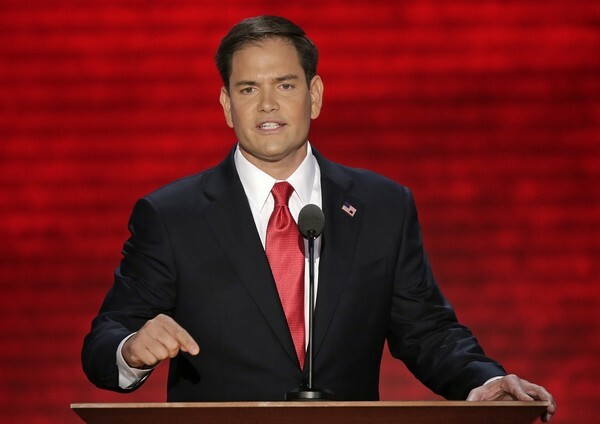 Rubio was logical choice to introduce the GOP nominee. He’s young, charismatic, and Latino -- at a time Republicans are trying to correct their deficit with youthful voters and Hispanics, not to mention address a charisma gap between their nominee and the Democrats’. And Rubio did not disappoint. Frequently interrupted by applause, the handsome freshman senator alluded to his own tender age -- he just turned 41 -- spoke Spanish briefly in his speech, and was unstinting in his praise of the GOP standard-bearer. At the same time, Rubio also introduced himself on the national stage. He is considered a fast-rising star who represents a diverse wave of the party -- showcased this week by several women and Latino speakers -- and someone who may one day embark on his own presidential bid. Still, Rubio knew the night belonged to Mitt Romney, and he argued that the former Massachusetts governor was best equipped to protect and preserve the dreams his parents held when they fled Cuba in the 1950s. Rubio, once vetted by Romney as a vice presidential contender, took a measured swing at the president, whom he described as divisive.